As of January 1, 2018, property services contractors in Oregon need to obtain a labor contractors license from the Bureau of Labor and Industries (BOLI). When getting licensed such contractors will not be required to comply with the license surety bond requirement if they have satisfied a number of pre-licensing requirements. At the same time, some contractors may still be required to post a bond under certain conditions specified in the Bill. 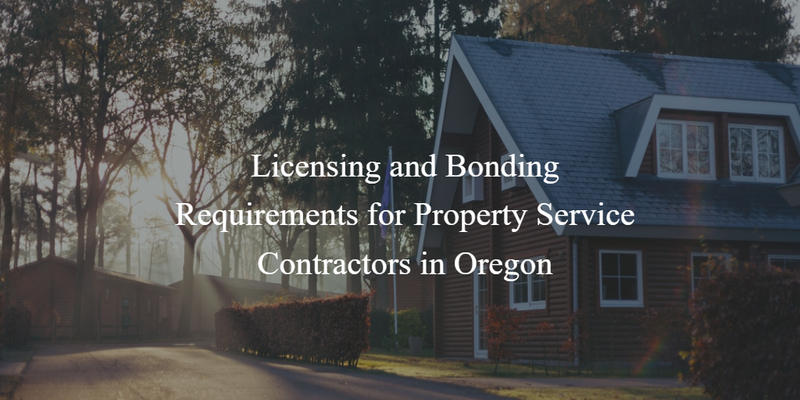 Read on for an overview of the new licensing requirements and when a property services contractor may have to post a bond. House Bill 3279 came into effect on January 1, 2018. Among its main provisions is the inclusion of property services contractors in the definition of a “labor contractors” in the state. Being included in that category, property services contractors are now also required to obtain a license from the BOLI and satisfy various pre-licensing requirements. Once the above requirements are fulfilled by applicants, and if their application is approved by the BOLI, they are issued a property services contractor license. See the next section for an explanation of the financial responsibility requirement and how applicants can opt out of it. HB 3279 states that applicants for this type of license have the choice to either comply with the financial responsibility requirements or avoid them if they comply with a number of other conditions. If applicants are in compliance with these requirements, then they are free from the requirement to provide financial security. Surety bonds are a form of protection for the state and the public. Applicants for a business license are often required to post them in order to guarantee their compliance with state laws and regulations. Bonds also serve as a financial guarantee. Under the bond agreement, any party that has been harmed as a result of the bonded business’s actions can file a claim and request compensation. The bond required of property services contractors is put in place as a guarantee for the payment of all sums due on wage claims of employees. It also guarantees the contractor’s compliance with the ORS. In other words, if a contractor violates the provisions of the ORS or in particular fails to pay wages to their employees, the latter can file a claim against the bond to request payment of wages that are due. Under the bond agreement, the surety must then step in to extend compensation to claimants, up to the full amount of the bond. In return, the bonded property services contractor must eventually reimburse the surety in full. In other words, bonds function as insurance for the employees of the contractors, but for the contractor, they are more like a line of credit. On the other hand, if a bonded contractor complies with all the conditions of their bond, they are only required to pay the initial premium for getting bonded. That premium is only a small fraction of the total bond amount which is usually why surety bonds are preferred over cash deposit. Cash deposits tie up the whole required amount ($10,000 – $30,000), which is money that could be used as working capital.